Mix the first seven ingredients in large bowl. Melt the butter with the honey and salt in a heavy small saucepan over low heat. Pour the butter over the granola mixture and toss well. Spread out the granola on two baking sheets lined with parchment paper. Bake for 40-45 minutes, stirring occasionally. 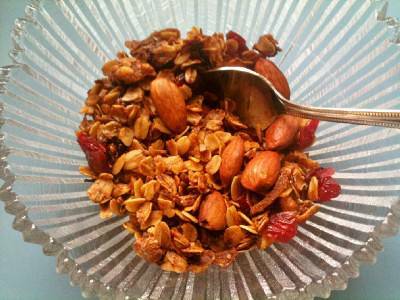 Make sure to not overcook it – the granola should be light brown and will still feel soft – it will harden as it cools. Add the cranberries and mix. Store airtight at room temperature for up to two weeks or freeze for up to three months. In Recipes-list.com we have selected the most viewed recipes from category - uncategorized . Enjoy the best recipes specially selected for you! Addictive Granola is the right choice that will satisfy all your claims.